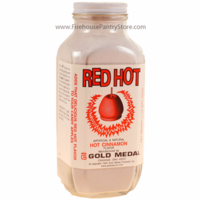 Our Red Hot Cinnamon Powder is a unique product made to add a sweet, spicy cinnamon flavor to anything you wish. The possibilities are endless - candied apples, kettle corn, homemade candy, cocktails, cookies, and all types of desserts. Upon first tasting the highly concentrated powder, I immediately thought of the flavor of Atomic Fireball Candy, and I suppose it's also a lot like red hot cinnamon imperials. It's sweet and certainly boasts a kick. 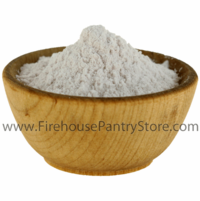 Though the powder itself is white/gray, it adds a red color to foods it's added to. Ingredients: sugar, artificial and natural cinnamon flavor, FD&C Red #40. Packaged in a facility that packages wheat, milk, soy, egg, peanuts, and tree nuts.